This page is a translated version of the page Kosca and the translation is 100% complete. The company was created from the activities of two German entrepreneurs, Paul Kohler and Christian Schaefer, in Pforzheim, in Germany around 1920, and from the initial letters of their names was born that of the company. The company was initially dedicated to the production of multi lead mechanical pencils, in gold and silver, capable of changing four colours. However, the Schaefer family managed the company mainly because Kohler left the business shortly afterwards. In Milan was founded the subsidiary with the Italian factory, the start of production is not known precisely, but according to an excerpt from a document of November 26, 1923, published in the book "The registered trademarks of the Italian Fountain Pens" there is an Italian branch with a representative Giuseppe Kügler, initially established in via Victor Hugo 2, then transferred to Corso Vittorio Emanuele 23, and then in via Conservatorio 6 in Milan (as shown by this invoice from 1929 and from an excerpt of 30 March 1926 published in the book "I marchi registrati delle Founlografiche Italiane" in which it's mentioned explicitly as a factory). The first trademark registration on their behalf was in 1929 (Reg. Gen. N. 40298), with a logo of the K&S initials; no trace instead of the number cited on the invoice (C.C.I. Milano 937773). In the same time the comapany registered also Spezial (Reg. Gen. N. 40301) and Spezial Super (Reg. Gen. N. 40299) trademarks. Much later, requested in 1938, is the Record (Reg. Gen. N. 59025) trademark, that was also renewed after the war. The Italian branch was managed by one of the four daughters of Christian Schaefer (Margarete Schaefer) who successfully extended and expanded the production to include fountain pens and mechanical pencils, as well as gold and silver objects such as frames, ashtrays, special cutlery, and then jewellery such as cufflinks, earrings and pendants, some on its own brand and others for great jewelers. Another son of Christian Schaefer, Walter Schaefer, ran a branch (only commercial) in Argentina during the period in which he lived in that country (approximately from 1935 to 1950). As for the Uhlmann's Eterno initial production was mainly of hard rubber pens overlays, which are considered among the best ever. 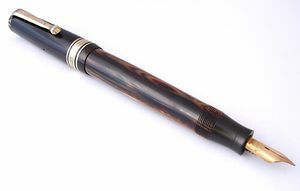 It is believed that the company have produced them also on behalf of other companies like Columbus, Omega and Ercolessi, and also for the Italian branch of the Waterman and for Parker. At least these last two relationships are well established, existing many examples of Waterman safeties and Parker pens explicitly marked by Kosca. The production of the second half of the '30s was in celluloid, in three sizes with a faceted clip embossed with Kosca imprint and decorated with a patterned band between two thin rings. The original headquarters in Pforzheim was closed in the 1960s. Instead, the Milan office, which later moved to via Cadibona 8A, continued to exist successfully for a long time, producing solid gold fountain pens and ballpoint pens in the 1950s, and continuing with ballpoint pens and other objects, when in the 1960s fountain pens left production due to the advent of ballpoint pens. The company remained in the hands of Margarete Schaefer until 2000, the year of her death, and was liquidated the following year by her niece. ↑ the majority of the data relating to this company comes from direct correspondence with the grandniece of Christian Schaefer, which allowed us to correct the errors and inaccuracies previously present on the page; some dates, such as that of the foundation or the closure of the original German company are still indicative; the names of the two founders are also in the patent nº GB-302015 (identical to nº CH-130454) registered in the name of Kohler & Schaefer. ↑ the production for Ercolessi was also confirmed in direct correspondence with the great-grandson of the founder. This page was last edited on 9 April 2019, at 23:39.